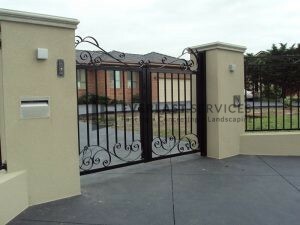 When it comes to front gates in Melbourne, Everlast Services are the best. We design our entry gates to be stylish, durable and easy to maintain; providing your home with the highest possible protection. When selecting a front gate, there are a number of options to consider. From single to double, sliding and swinging, the range of driveway gates on the market is something that needs to be researched. Everlast Services can help you with this, as we create customised front entry gates that are tailored to suit your needs. We create automatic front gates that provide the highest standard of security, protecting your home while providing you with a stylish visual that adds value to your house. With free quotes and property visits, you really have nothing to lose when you work with us. We also design and fabricate our own steel and aluminium gates at our Hoppers Crossing manufacturing plant. This allows us to cut out the middleman, reducing costs for you. It also makes everything fully customisable, as we can create the front gate of you desire, right in front of your eyes. Why Choose Everlast Services for Your Front Gate? Having our own manufacturing plane in Melbourne allows us to quality control all of our products. We can vouch for their high standard as we are directly involved in the process. Everlast Services only utilises 100% Australian owned and made materials. We are also Australian owned, so every dollar spent is generated back into our economy. Our company is committed to providing the highest standard of quality, at a competitive price point. With over 20 years experience behind us, you can be assured that our experience and knowledge is valued within the industry. When it comes to designing, fabricating and installing gates, we have the highest quality behind our workmanship. Because of our manufacturing plant, we can also provide the materials if you are undergoing a DIY job. Not only this, but we can assist you in providing invaluable advice for your task at hand. If you are in the market for an entry gate, then Everlast Services is the company to call. We have over 20 years experience in this industry, so let us help you with your next project.